When the Bavarian ministers decided to drag crazy King Ludwig II out of his still unfinished fantasy castle in 1886 and throw away the key (he was found dead a short time later, “mysteriously drowned” in about three feet of water. Note that the Krazy King was more than six feet tall) they should have been knocked upside the head. Ludwig’s weird fantasy Neuschwanstein Castle has become not only a symbol for all of Germany (thanks to Disney) but also a huge cash machine, forking more than $15,600,000 annually to the Bavarian treasury. Add to that the ancillary income from hotel stays, food, souvenirs, airplane rides, buggy rides behind plodding and probably very tired horses and more, and you have an annual moneybag of about $30,000,000. (Thirty million for those who have a hard time with numbers) Now, the government (ticket takers and all connected with this scheme) likes to claim that all of this money is needed for “maintenance” but I say horsepuckey. (if there is such a word) The government ministers, probably great-great-great grandsons of the ministers who murdered Ludiwg (shudder to think that he just fell over and hit his head on a rock in the water) have raked in more than *four hundred billion dollars since this wacky landmark was opened to the public. The monarch had more castles planned, even more fantastic than Neuschwanstein. Had he been left alone, the Bavarian roads would be paved with silver and the trees flocked with gold. As the zillionth tourist buys his ticket to trod through this part of Ludwig’s dream world, the King is having the last laugh, wherever he is. 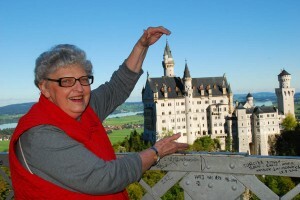 Posted in Europe Tours and tagged bavaria, castle, ludwig, neuschwanstein.